On occasion I have asked both students and teachers: "Is it more important to be right... or to be reconciled?" As educators, we understand the importance of relationships. James Comer noted, "No significant learning occurs without a significant relationship." Without a doubt, effective school leaders understand the importance of building positive relationships within a school building. Sometimes, relationships get broken, and as a principal, I am wired for reconciliation. I want aggravated parents to be on the same page with their child's teacher. I want quarreling students to work through their differences. And when I realize I have inadvertently alienated a staff member, I work hard to mend that fence. 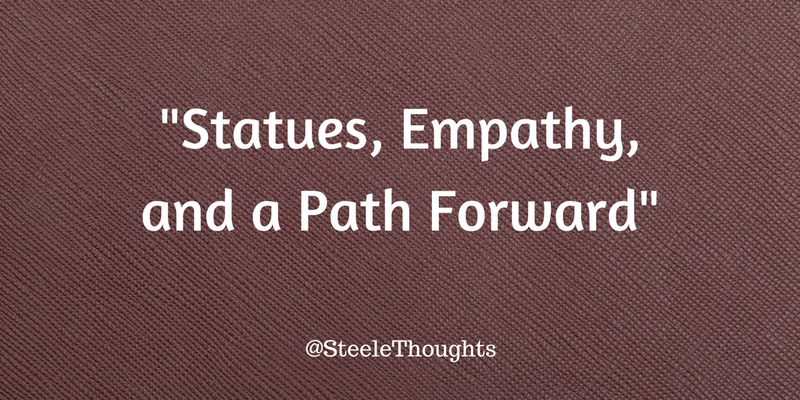 The personal quality that goes the furthest toward achieving reconciliation... is empathy. This is sort of a letter to my fellow Americans who want to preserve the Confederate monuments. I feel compelled to write it because much of what I've seen and heard lately reflects a lack of understanding of the emotions on the other side. (I choose to believe that it is a lack of understanding and not a total indifference. An "indifference" would bring me too much sadness.) It is my belief that we will never achieve reconciliation without an attempt to understand. 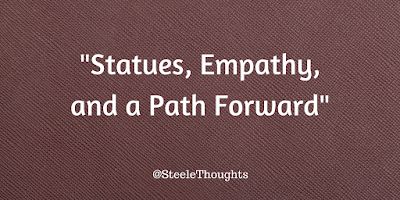 Statues are not just about "history." They are about a specific kind of history ... the history that we want to honor -- the history that we want to celebrate. Make no mistake about it -- slavery is an ugly stain in our country’s history. And the racism and discrimination that persisted after the Civil War has left a tragic legacy with which we are still dealing. The South fought the Civil War to preserve the institution of slavery. I actually have ancestors who fought for the confederacy. But they were on the wrong side of history, and they should not be honored. Robert E. Lee's statues need to come down because there is no redeeming value to his historical contributions. To those who would argue that the removal of Confederate monuments puts us on a “slippery slope” that will eventually lead to the removal of statues of our founding fathers and the blotting out of our history, please reflect for a moment. History books tell us what history we should remember; statues tell us what people in that history we should revere. MLK was unfaithful to his wife, but we still have statues of him because he was and is a revered leader of the Civil Rights Movement. His legacy... his contribution to history, has nothing to do with his marriage. Thomas Jefferson had slaves, so his character was flawed to be sure. But we honor him with statues because he made contributions to our history that transcend his moral failings with respect to slavery. Taking down statues does not erase our history; it simply clarifies our national values and underscores our capacity for redemption. Removing certain historical monuments is not “rewriting history”; it is redefining what it is in our history that we honor. In a very difficult moment in our nation's history, Robert F. Kennedy said, "But we have to make an effort in the United States. We have to make an effort to understand, to get beyond ... ." To those of you who don’t see what the big deal is, I would encourage you to consider how Confederate monuments are perceived by African Americans. What you see as a harmless statue, others see as a reminder of the unspeakable evil that was visited upon their ancestors... and is still visited upon them, as they live in a society that honors those who owned their ancestors. The bigotry and racism that still confront many African Americans is a testament to the fact that the monuments don't just point to an ugly past... but a painful present. As long as those monuments stand, we will not be reconciled with the darkest chapter of our history. I want to work in a school that is characterized by empathy and a collective commitment to understanding one another. I want to live in a country that reminds me of my school. As school leaders, we build a stronger culture within our building when we work to restore relationships that are broken. As citizens, we make our country stronger when we demonstrate empathy toward those whose heritage may be different than ours. This is not a post about politics. It is a post about people... about relationships… and about the values we want to define us as a country. It is my hope that all of my comments are constructive. Please don't make any political comments on this. If you want to engage in some dialogue, feel free to call me or send me a message. Peace. Wow! This is the best piece I have seen written on this topic. Thank you! I had the opportunity to see you present at the ASCD conference this past spring and my professional life has been changed because of it. Please know that your flame has ignited many candles and we are all better because if it. Just read to my husband; he said the whole country needs to hear your words! We are grateful. I really happy to read your words that you have written in this article. For living a successful and respectful life, it's necessary to become good human as your write and I appreciate your and all your words that help me in many matters. I must must this content with my friends and hare you can buy custom assignment online because its best option for all students to get task as their own desire. This was a really inspiring post and the words you used are really powerful. Thank you so much for making such efforts of writing such content. Everyone appreciates it.